The sky was a brilliant blue, and the day was hot and still as Diana Goode stepped out of the limousine with her father. The angles of her face were softer than usual beneath a haze of creamy ivory veil, and the heavy satin dress whooshed softly as the driver helped her out and settled it around her. She beamed at her father, standing outside the church, and then she closed her eyes, trying to remember absolutely every detail of the moment. She had never been this happy in her life. Everything was perfect. “You look beautiful,” her father said softly, with All Saints Episcopal Church in Pasadena rising behind her. Her mother had gone ahead in the other car with her sisters and their husbands and children. Diana was the middle child, classically striving to be better, smarter, more successful. She loved her sisters with a deep, solid affection, and yet she always felt she had to do something more than they did. Not that they had set such impossible standards. Her oldest sister, Gayle, had been set on going to medical school, until she met her husband in her first year of premed, married him that June, and instantly got pregnant. At twenty-nine, she had three adorable little girls of her own now. Gayle was two years older than Diana, and although they were close, there had always been a sense of rivalry between them, and the two women were astoundingly different. Gayle never looked back at a career in medicine once. She was happily married, and satisfied to stay home with her girls, and keep busy with them and her husband. She was the perfect doctor’s wife, intelligent, informed, and completely understanding about his hours as an obstetrician. They were planning to have at least one more child, Gayle had confided to her a few weeks before. Jack was desperate for a boy now. Gayle’s whole life revolved around her husband, and her children, and their home. For her, the world of careers held absolutely no appeal, unlike her two younger sisters. In some ways, Diana had more in common with her younger sister, Sam. Samantha was ambitious, competitive, excited about being out in the world, and for the first couple of years she was married, she had desperately tried to juggle both home life and career. But when her second child was born thirteen months after the first, a mere two years after she’d gotten married, she admitted that she just couldn’t do it. She quit her job at an art gallery in L.A. and decided to stay home, which was welcome news to her husband. Although for months after she’d quit, Sam felt disappointed not to be working. In the two years they’d been married, Seamus’s work had begun to be recognized and admired, and he was slowly becoming one of L.A.’s most successful young contemporary artists. Sam did free-lance design work from home, but even that was almost impossible to do, with no help and two very young children. She adored being home with Seamus and her babies, and they had a great marriage, and their son and daughter were two little fat cherubs. Everyone who saw them instantly loved them. But still, there were times when she envied Diana’s place in the working world, among “grown-ups,” as she put it. But in Diana’s eyes, her sisters’ lives seemed so settled. As far as she could see, at twenty-five and twenty-nine, her sisters seemed to have everything they wanted. Sam was happy and at ease in the world of modern art, Gayle was equally so as the wife of a doctor. But Diana had always wanted so much more than they had. She had gone to Stanford, and then did her junior year abroad, in Paris, at the Sorbonne. And she had returned to Paris for yet another year there after graduation. She had found a fabulous little apartment on the rue de Grenelle, on the Left Bank, and for a while she had decided that she really was going to stay there. But after a year and a half working for Paris-Match, she got homesick for the States, and her family . . . and most of all, much to her own surprise, for her sisters. Gayle had been having her third baby then, and Sam had been expecting her first, and somehow Diana just felt that she wanted to be with them. But she felt torn when she got back, and tortured herself for the first few months about whether or not coming back had been the right thing. Maybe she hadn’t tried hard enough to stay there. Paris had been great, but L.A. was interesting, too, and she had landed a great job almost instantly when she returned, as a senior editor at Today’s Home. The magazine was still new then and the opportunities were exciting. The salary was good, the people were nice, the working conditions were great, and they gave her a fabulous office. Within months she was running shoots, hiring photographers, rewriting some of the stories herself, and flying off to look at extraordinary homes in exotic locations. She even got back to Paris now and then, and London. She shot one issue in the south of France, another in Gstaad. And of course New York, Palm Beach, Houston, Dallas, San Francisco, and other American cities. It was the perfect job for her, and it made her the envy of her friends, and even her sisters. To anyone who didn’t realize what hard work it was, it looked extremely glamorous, and so did Diana. Shortly after she took the job, Diana met Andy at a media party. They talked six hours straight in a little Italian restaurant the night they met, and after that she hardly had time to catch her breath before he asked her to move into his apartment. She waited six months before she did, cautious about giving up her independence. But she was crazy about him, and he knew it. He was wild about her, too, and everything about them was a perfect mesh. They seemed to be ideally suited to each other. He was tall and handsome and blond, had been a tennis star at Yale, was from an old, respected family in New York, and had come to UCLA to go to law school. And as soon as he graduated, he had gone to work in the legal department of a major network. He loved his work, and Diana was fascinated by what he did, and the people he knew there. He was the legal counsel for several important shows and the network was extremely pleased with the way he handled their more complicated contracts. Diana loved going to business parties with him, meeting some of the stars and talking to other lawyers, big producers, and important agents. It was heady stuff, but Andy took it all in stride. He had a good head on his shoulders, a bright mind, and he was seldom impressed by the glamour of the world he worked in. He liked what he did, and eventually he planned to open his own practice, specializing in entertainment law. But he knew it was still too soon, and appreciated the valuable experience he was getting at the network. He knew exactly where he was going and what he wanted out of life. He had carefully mapped out his career long before, and when Diana walked into his life, he knew within a matter of days that this was the woman he wanted as his wife, and the mother of his children. And they had laughed when they discovered that they both wanted four children. He had been one of four boys, which included a set of identical twins, and Diana wondered if they would have a set of their own. They talked a lot about having kids, and Diana realized that once in a while their sexual carelessness was born of their desire to tempt the fates and get pregnant. Neither of them would have been distraught if Diana had gotten pregnant and forced them into an early marriage. Within months of the day they met, they both talked openly about wedding plans and their long-term intentions. They lived together in a small but handsome apartment in Beverly Hills. They shared much the same taste, and they had even bought two paintings from Seamus. With their combined incomes, they could afford something really nice. They decorated in stark modern style, and spent all their extra money on art. One day they wanted to start an important collection, but they couldn’t afford it now, so they bought what they could and enjoyed it immensely. But what really pleased Diana about Andy was how well he got on with her parents, and with her sisters and their husbands. As different as Jack and Seamus were, Andy seemed to like both of them, and frequently had lunch with them when he didn’t have a business lunch scheduled at the network. And he seemed to be just as much at ease in Seamus’s world of art as he was in Jack’s world, either discussing medical research or financial investments. Andrew Douglas was an easy, likable guy, and everything about their life together thrilled Diana. They went to Europe together after the first year, and she showed him all her favorite haunts in Paris, and afterward they drove through the valley of the Loire. And then they went to Scotland to visit Nick, Andy’s younger brother, who was spending a year there. It was the perfect life, and after they got home, they started making leisurely plans to get married the following summer. They got engaged eighteen months after they met, and set the wedding date eight months later, in June, and decided to go back to Europe for their honeymoon, to the south of France this time, Italy, and Spain. Diana had managed to get three weeks off from the magazine, and Andy had wangled the same amount of time from the network. They looked for a house in Brentwood, Westwood, and Santa Monica, and even thought about commuting from Malibu when they saw something they really loved there. But in March they found the perfect house, in Pacific Palisades. It had been well loved and well tended by a large family for years, and now the children had grown and gone and the couple who owned it were reluctantly selling. Andy and Diana fell in love with it at first sight. It was big and rambling and warm, there was wood panelling, and there were wonderful trees just outside and a huge garden for the children to play in. There was a lovely master suite on the second floor, and an office for each of them, as well as a handsome guest room. And on the floor above were four huge children’s bedrooms. The closing on the house was in May, and Andy had moved into it just three weeks before the wedding. The night of the rehearsal dinner, which Diana’s parents gave at the Bistro in Beverly Hills, there were still boxes everywhere, and Diana had left her bags for their honeymoon in the front hall. She didn’t want to spend the night before the wedding with him, and she was spending the night at her parents’. She spent it in her childhood bedroom, and lay for a long time after she woke up, looking at the faded pink-and-blue flowered wallpaper she knew so well. It was funny to think that in a few hours she would be someone else, someone’s wife . . . what did that mean? Who would she be then? Would it be different than it had been living with him? Would he change? Would she? Suddenly it all seemed more than a little scary. She thought of her sisters then, the men they had married, the children they’d had, and how it had all changed them, subtly at first, and then over the years, they seemed to become sort of a unit with their children and husbands. She was still close to them, but in subtle ways it was just a little different. It was odd to think, too, that a year from now she might have her own child. The idea gave her a small thrill in the pit of her stomach. Making love to Andy was always so extraordinary, but it was even more exciting to think that one of these days it might bear fruit, and they would have a baby. She loved Andy so much, and loved thinking about having his children. She was still smiling to herself when she got up on her wedding day, thinking about Andy and the life they would share. She went downstairs for a quiet cup of coffee before everyone got up, and her mother came down after that, and half an hour later her sisters and their children arrived to dress there, and help Diana get ready for the wedding. Their husbands had stayed home, both were going to be ushers in the wedding. Gayle’s three girls and Sam’s one little girl were going to be flower girls, and Sam’s little boy was going to be the ring bearer. He was just two, and he looked so cute in the little white silk suit Diana had picked out for him, she and her sisters had tears in their eyes when they saw him. Diana’s mother rounded the children up shortly after they arrived, and she’d hired a girl to help keep them in order while their mothers dressed. “Typical,” Gayle had cracked with a grin and a raised eyebrow. Their mother usually thought of everything, planned for all contingencies, and was so organized as to make everyone groan when she started calling them in June to find out what their plans were for Thanksgiving. But her mother had been a godsend for Diana in putting together the wedding. She had been so busy herself at the magazine, she’d scarcely had time to go to her own fittings, but her mother had handled everything, and Diana knew that, as a result, everything would go smoothly. And so far, it had. Her sisters looked beautiful in their pale-peach silk gowns, and they were carrying the palest peach-color roses. And the little girls looked exquisite, too, in their white dresses with peach-colored sashes, carrying baskets of rose petals in their little gloved hands, as they left for church with their grandmother and mothers. Diana stayed and chatted with her father for the last few, nerve-wracking moments. “You look just beautiful, sweetheart,” he beamed at her. He had always been so proud of her, so decent and kind and supportive. She had no complaints about her parents, there had been no hidden agendas here, no unreasonable demands, no animosities, not even as she was growing up, from what she remembered. Gayle had had a harder time with them, and she and their mother had had their share of violent disagreements. But Gayle was their first, and “I was breaking them in,” she always explained later. But Diana had always thought her parents were pretty reasonable, and Samantha agreed with her, most of the time, although at first the senior Goodes had been a little nervous about her marrying an artist. But eventually they had grown to admire and respect him. Seamus was a character unto himself, but it was difficult not to like him. And they had no reservations at all about Andrew Douglas. He was a lovely man, and they knew Diana would be very happy with him. “Scared?” her father asked gently, as she paced a little in their living room, waiting the last few moments before going out to the limousine that would take them to her wedding. They still had a little time, and suddenly Diana wished it were all over and done, and they were at the Bel Air that night, or on the plane to Paris the next morning. “Sort of.” She grinned, looking like a kid again. Her long, reddish-brown hair was swept up in a bun beneath her veil, and she looked remarkably sophisticated, and at the same time very young, as she looked at her father. She had always been able to turn to him, to tell him what she felt, to share her griefs and fears with him. But she had no serious fears now, only a few unanswered questions. “I keep wondering if it’ll be different now . . . being married, I mean . . . you know, instead of living together. . . .” She sighed, and smiled again. “It all seems so grown-up, doesn’t it?” At twenty-seven she still felt so young, and yet at times so old. But it seemed a good time to be getting married, especially to a man she loved as much as she loved Andrew William Douglas. “I do.” Her eyes filled with tears as she looked away. She suddenly felt so emotional to be leaving him, and this house, even though she no longer lived there. It was harder leaving him, in some ways, than her mother, who was busier and more matter-of-fact, and had been engrossed in straightening Diana’s veil and keeping the children from stepping on her train before they left for the church. But there were no distractions now, only love and hope, and an avalanche of feelings, as she stood in the living room with her father. “Come on, young lady,” he finally said, his voice gruff but loving. “We have a wedding to go to.” He grinned at her and offered her his arm, and he and the driver helped her into the car with her long train and full veil, and a moment later she was settled in the backseat, carrying her huge bouquet of white roses. The fullness of the gown was spread all over the car, and she was suddenly startled as they drove away to see children waving and pointing at her. “Look! . . . Look! . . . A bride! . . .” It was funny to realize that she was the bride, and she felt giddy with excitement as they drove away. Suddenly she could feel her heart pounding, as she readjusted her veil and straightened the lace bodice and huge satin sleeves that had been adjusted endlessly in the fittings. The dress was very Victorian in style, and extremely formal. They were having three hundred people to the Oakmont Country Club for a reception afterward. Everyone would be there–her old school chums, her parents’ friends, distant relatives, people she knew from the magazine, Andy’s friends, and a host of people he had invited from the network. His closest friend from work, William Bennington, was going to be in the wedding. And a few of the stars he had worked closely with on their contracts were coming. His parents and all three of his brothers had come too. Nick, who’d been in Scotland, was working in London now, and Greg and Alex, the twins, were at Harvard Business School, but they had all come. The twins were six years younger than Andy, who was thirty-two, and he had always been their hero. They were crazy about Diana, too, and she was looking forward to seeing more of them, to having them come out during vacations from school, or maybe even talking them into moving to California. But unlike Andy, the other Douglas boys preferred the East, and Greg and Alex thought they would probably wind up in New York or Boston, or maybe even in London, like Nick. “We’re not star-struck like our brother,” Nick had teased him good-naturedly the night before at the rehearsal dinner. But it was obvious that they admired his success, and his choice of bride. The three boys were clearly very proud of their oldest brother. Diana could hear the organ music in the church as they stood outside. She took her father’s arm, and she felt a little tremor of excitement run through her. She looked up at him with eyes as blue and electric as his own, and as they started up the steps of the church she squeezed his hand. “Here we go, Daddy,” she whispered. “Everything’s going to be just fine,” he reassured her, just as he had the night of her first play . . . and the time she’d fallen off her bike and broken her arm when she was nine, and he drove her to the hospital, telling her funny stories and making her laugh, and then holding her tight against him when they set it. “You’re a wonderful girl, and you’re going to be a great wife,” he said to her as they stopped just outside the main door, waiting for a signal from one of the ushers. “I love you, Daddy,” she whispered nervously. “I love you, too, Diana.” He bent and kissed a froth of veil, as the pungent smell of the roses seemed to surround them. It was a moment they both knew they would remember for a lifetime. “God bless you,” he whispered as the signal came, and her sisters began walking slowly down the aisle, followed by three of Diana’s oldest friends, in the same peach gowns and huge organza hats, and then a cavalcade of adorable children. There was a longish pause as the music became more imperious, and then slowly, slowly, regally and gracefully she came, a young queen going to meet her consort, in the white satin dress with the narrow waist and the beautiful ivory lace inserts. The veil seemed to surround her like a soft haze, and beneath it the well-wishers could see the shining dark hair, the creamy skin, the brilliant blue eyes, the nervous half smile, her lips slightly parted, and then she looked up and saw him, tall and handsome and blond and waiting for her. The promise of a lifetime. Andrew had tears in his eyes as he looked at her. She looked like a vision as she glided slowly down the aisle carpeted in white satin. And then at last, holding her bouquet in trembling hands, she stood before him. Andy gently squeezed her hand, and the minister solemnly addressed the congregation, reminding them of why they had come, of their awesome responsibility as family and friends to support the young couple in their vows, for better or worse, in sickness and in health, for richer or poorer, until death did them part. He reminded Andrew and Diana that the road would not always be smooth, that the fates may not always be kind, but that they must be there for each other, in witness to their vows, faithful to each other, and strong in their love for each other and the Lord. They made their vows to each other in strong clear voices, and by then Diana’s hands had completely stopped shaking. She wasn’t frightened anymore. She was with Andy. Where she belonged. And she had never, ever been happier in her life. She was beaming when the minister declared them man and wife. The narrow gold band Andy had slipped on her finger gleamed in the sunlight, and as he bent to kiss her, the love in his eyes was so tender that even her mother finally cried. Her father had cried long before that, when he left her at the altar beside the man she loved. He knew that it would never be quite the same for them again . . . she belonged to someone else now. They walked down the aisle looking radiant and proud, and they were still beaming as they got into the car to go to the club for the reception. And after that, the dancing went on until six o’clock. It seemed to Diana as though everyone she had ever known, and several hundred people she hadn’t, had been invited. And by the end of the afternoon, she felt as though she had danced with everyone there, and she and her sisters had had a hysterical time doing the limbo with Andy and his brothers. Both of the twins had had to dance with Sam, since there were four Douglas boys and only three Goode sisters, but Sam seemed to love it. She was only a year younger than the twins, and they were all great friends by the end of the reception. And Diana was touched to see how many of Andy’s friends from the network came, even the chairman had come with his wife, although they only stayed for a little while, but it had been nice of them to come at all, and her editor-in-chief from Today’s Home had come, too, and he had danced several times with Diana, and with her mother. It was a beautiful afternoon, a perfect day, the beginning of a life she had always dreamed of. Everything had worked out perfectly in her life so far. Andy had come into her life at the right time, they had been happy for the past two and a half years, and she had loved living with him, and now it seemed the perfect time to be married. They were both sure of each other and themselves, and what they wanted out of life. They wanted to be together, to share their lives, and to build a family like each of their own. They had so much to share, so much to give. Diana felt for an instant as though it was almost too perfect, as she stood and looked at him, just before she went to change out of her wedding gown. She hated to take it off, never to wear it again, to turn the reality into a memory. She wanted the moment never to end, as she looked up at her brand-new husband. “You look incredible,” he whispered to her, as he swept her onto the dance floor again for one last waltz before they left the party to begin their life together. “I wish today would never end,” she said, closing her eyes, and thinking of how wonderful it had been. “Very.” He grinned, moving closer to her, and his meaning was not lost on her as she chuckled. “Shame on you.” She laughed at him as they continued to waltz around the dance floor. “It was not one night . . . it was longer . . . I know it.” He pulled her closer to him again, and rested his cheek against her veil, as she gently touched his neck with delicate fingers. “You’ll have to make it up to me for weeks, starting”–he glanced at his watch–”in about half an hour.” The music slowly came to an end and he looked at her tenderly. “Ready to go?” She nodded, sad to leave their wedding, but it was time, it was after six o’clock, and they were both tired. Her bridesmaids went upstairs with her while she changed, and Diana slowly took off the beautiful gown and the veil. Her mother carefully hung them up on specially padded hangers, and watched the younger women’s excitement with a little smile, from a distance. She loved her girls more than anything. They had brought her such joy, and now she was happy to see them all well settled, and happily married. Diana put on the ivory silk suit her mother had picked out with her at Chanel. It was bordered in navy blue, with a handbag to match, and it had big pearl buttons. Diana had bought a cream colored hat, too, and she looked wonderfully chic when she went back downstairs to meet her husband, carrying the huge bouquet of white roses. His eyes lit up as she walked into the room again, and a moment later she had thrown her bouquet, and he had thrown her garter. And amidst a hailstorm of rice and rose petals, they ran to their car, after quick kisses to their siblings and their parents. They promised to call from the trip, and Diana especially thanked her parents for the beautiful wedding. And then they were gone, in a long white limousine, off to the Bel Air Hotel for their wedding night, to stay in a huge suite overlooking the hotel’s carefully landscaped gardens. Andy put an arm around her as the car drove away, and they both sighed in relief and exhaustion. “Wow! What a day!” he said, as he leaned back against the seat and looked at her in silent appreciation. “You were a gorgeous bride!” It was so odd now to think it was all over. “You and your mom did a fantastic job. Every time I talked to someone at the network they said it was better than anything they’ve seen on a movie set.” It had been loving and happy and filled with their family and friends, but it also wasn’t showy. “Your sisters were a riot too. You guys really get out of hand when you get together, don’t you?” He teased her, and she sat up in feigned outrage. “Don’t be silly.” Andy looked demure as he pretended to look out the window, and his new wife pushed him, almost onto the floor, as he chuckled. “I don’t remember that.” He was all innocence, and they were both laughing. “My new suit?” She looked horrified, and he grinned in anticipation. “Thank you.” They held hands and chatted in the backseat, feeling new in their love again. In a funny way, it was almost like starting at the beginning, except that they were old friends, and everything they did was comfortable and blessed by the love they had for each other. When they arrived at the hotel, a desk clerk walked them down the path into the main building, and they smiled at each other as they walked past a discreet sign pointing the way to the Mason-Winwood wedding. “Must be a big day,” Andy whispered to her, and she smiled. They glanced at the gardens and the swans, and they were thrilled when they saw their room. It was on the second floor, and it had a huge living room, a small kitchenette, and a fabulous bedroom all done in a delicate French flower print and pink satin. It looked like the perfect place for their wedding night, the living room had a fireplace, and Andy was hoping it would be cool enough that night to light it. “It’s beautiful,” she said, as the bellman left, and the door closed behind him. “So are you.” He gently took off her hat and swooped it through the air onto a table. And then he carefully undid her hair and ran his fingers through it, as it fell to her shoulders. “You’re the most beautiful woman I’ve ever seen . . . and you’re mine . . . forever and ever and ever . . .” He sounded like a child, telling a fairy tale, but that was what they had promised. And the bride and groom lived happily ever after. . . .
“And you’re mine too,” she reminded him, but he didn’t need reminding, and he had no objection. The elegant new Chanel suit was quickly unbuttoned as they kissed, and the jacket fell to the floor as he lay her on the couch, and a moment later his own clothes were beside it. Their clothes lay tangled on the floor while their bodies lay long and lean and taut as they discovered each other for the first time as man and wife. All their passion, all their promises, seemed to come together in a single moment of abandon, and Diana lay clinging to him as though she would never let him go, not for a moment or a lifetime. Their ecstasy rose, and they shuddered with pleasure, and then lay peacefully in each other’s arms long after it was over. It was sunset by then, and long pink and orange fingers of light streaked into the room, as they lay together, thinking of the life they would always share now. “I’ve never been so happy in my life,” he said softly. “I hope we make each other happy,” he added, and then unwound his long limbs from hers and stood up, smiling down at her, and he walked slowly to the window. The black and white swans were gliding smoothly on the pond, and the lawns looked perfectly tended. Young people in brightly colored cocktail dresses were hurrying to an area just beyond their view, as strains of show tunes wafted through the evening air toward them. “That must be the Mason-Winwood wedding.” Diana smiled at him, still lying on the couch, and suddenly hoped that they had just made a baby. They had used no precautions at all this time, they had no reason to anymore. They had agreed not to, and see what happened, as soon as they were married. Both of her sisters had gotten pregnant on their honeymoons, and she suspected that the same might happen to them, which genuinely pleased her. 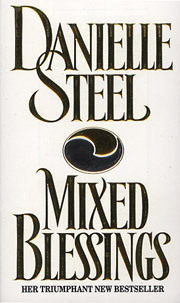 Excerpted from Mixed Blessings by Danielle Steel. 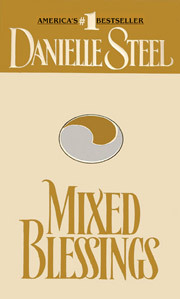 Excerpted by permission of Dell, a division of Random House, Inc. All rights reserved. No part of this excerpt may be reproduced or reprinted without permission in writing from the publisher.